Kaplan International Colleges, one of the best providers of English language courses internationally announced that they were opening a new residence in Oxford for English language students. Students studying Kaplan English courses in Oxford will have an opportunity to stay in Kaplan’s new Mansion Mews student residence opening from June 29th 2013. The high quality residence will complement the existing rooms in Cambridge Terrace in Oxford. Students will find it easy to move around as the new housing is just a ten minute bus ride from the centre of Cowley and a further ten minutes from the school itself. The rooms will provide a great sense of comfort and privacy whilst offering a community space for students to interact and socialise amongst themselves. The accommodation will offer a large communal lounge and kitchen, and rooms will come in a range of four, five and six bedroom cluster flats. 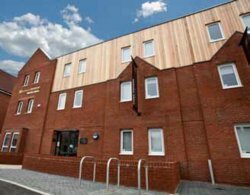 The flats are stylish and include a three quarter size bed, en-suite shower room and high-speed internet connection. Students will certainly enjoy their time in Oxford with Kaplan!